There are currently 24 users and 1678 guests online. 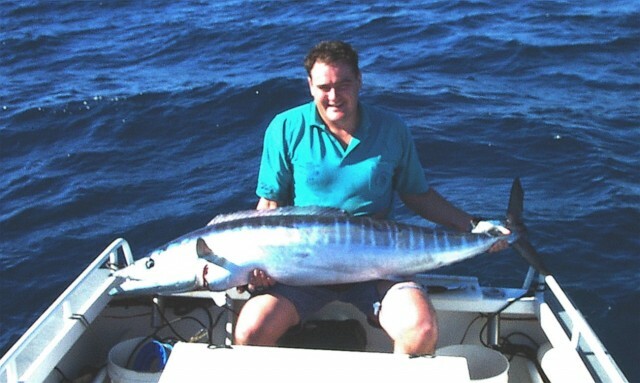 2002 PB Hoo taken on 15kg/red & white CD18. 55 metres of water north of Coral Bay. Didn't that drag scream on the initial run. Go north Luke! Lock in that date ASAP. Nice wahoo matey! Go like the clappers I bet! Either thats a small boat or you really are BIG John. :) Nice hoooo indeed. Old school 5.2 m trailcraft. I weighed about 230 lbs in that pick so its fair to say it was a good hoo. Hopefully I'll catch up with you at the xmas drinks if things go to plan.